Biochemistry - Welcome to The Frog Pad! Water is the most important compound in living things. Water makes up 75-90% of an organism. --Water is a polar molecule. 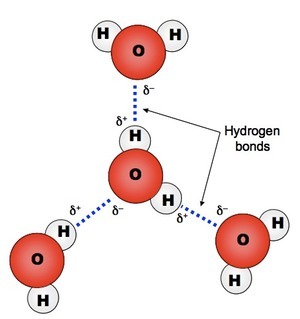 --It consists of 1 oxygen atom and 2 hydrogen atoms covalently bonded. This means that the valence electrons are being shared. However, it is an uneven (or unequal) sharing. This is a type of covalent bond called polar covalent. It makes the oxygen side of the water molecule is slightly negative and the hydrogen side slightly positive (opposite poles). Hence , the reason why water is a polar molecule. 1. Universal Solvent: Because water is polar, it can dissolve many things very well. Carbon has an AWESOME ability to combine with other carbon atoms and other elements forming the key complex molecules that virtually ALL LIFE depends on. The secret of this element's versatility is due to the four electrons in its outer valence level. 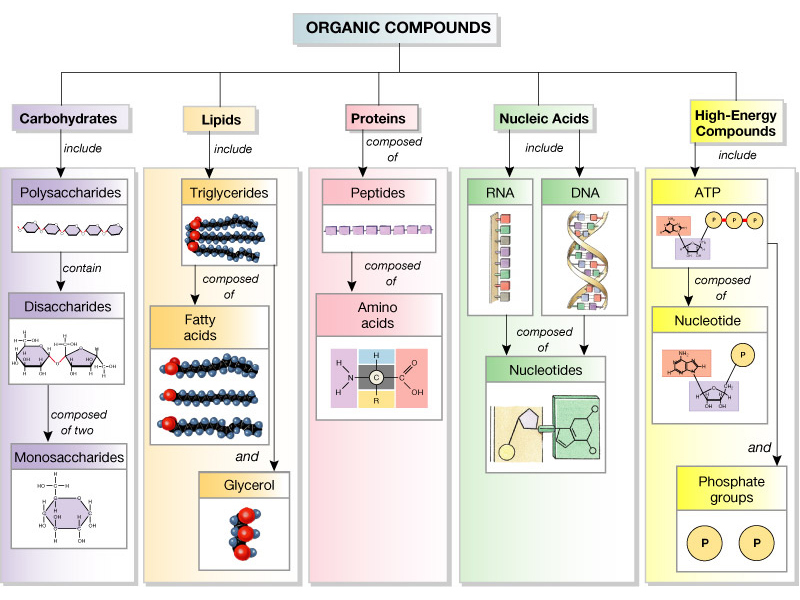 Organic compounds are macromolecules (very large molecules). There are four classes of macromolecules: carbohydrates, lipids, proteins and nucleic acids. These polymers are made up of smaller units, called monomers. Polymers are formed by the bonding of monomers. The monomers join by a process called dehydration synthesis in which an enzyme removes the -OH from one monomer and a -H from another monomer. This forms a water molecule as a byproduct. Polymers can be broken down in a process called hydrolysis which is the opposite of dehydration synthesis. Water is inserted to split the monomers apart. Enzymes are special types of proteins. Enzymes are responsible for a lot of the work that is going on in cells. They act as catalysts in order to help produce and speed up chemical reactions. When a cell needs to get something done, it almost always uses an enzyme to speed things along. The molecule or substance that the enzyme reacts with is called the "substrate." Like all proteins, enzymes are made from chains of amino acids. These protein chains are folded into very precise shapes that create an active site - a place on the enzyme where the substrate attaches and the chemical reaction takes place. Changing the order of amino acids would cause it to fold into a different shape. Therefore, each enzyme's active site is suitable for one specific type of substrate – just like a lock that has the right shape for only one specific key. Changing the shape of the active site of an enzyme will cause its reaction to slow down until the shape has changed so much that the substrate no longer fits. When this happens the reaction stops. At this point we say the enzyme is denatured and is permanently damaged. Temperature - The temperature can affect the reaction rate. The higher the temperature, the faster the reaction will occur. However, at some point the temperature will become so high that the enzyme will denature and stop working. pH - In many cases the pH level, or acidity, of the environment around the enzyme and substrate can affect the reaction rate. An extreme pH (high or low) will typically slow the reaction or even stop the reaction altogether. The Amoeba Sisters put the biomolecules in simple terms. Mr. Andersen's videos about the macromolecules (AKA polymers). He's awesome! Wath this video to learn about protein structure.